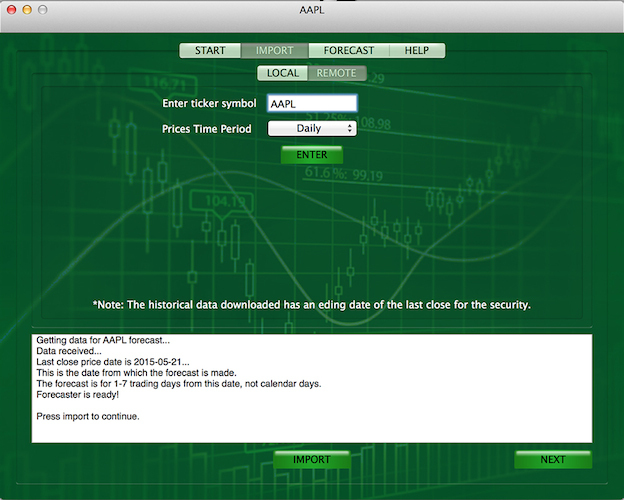 Quickly & Easily Predict Future Stock Market Prices! Datamate™ Market Forecaster is an easy to use financial markets forecasting application employing the most advanced artificial intelligence and machine learning available resulting in forecast predictions with over 85% accuracy! Now you can quickly and easily forecast the future price direction for daily, weekly, and monthly time periods of equity markets, bond markets, options and derivatives markets, and others with confidence. Our market forecaster can be used to forecast the direction of any market security such as stock market equities, foreign exchange currencies, stock options, commodity and financial futures with great accuracy for up to 7 time periods forward (days, weeks, or months). • Fully automated online prices data feed • Automatically handles missing input data • Automatically handles input data outliers • Forecast daily, weekly, monthly prices • Save and load import settings • Built in Quick Start and Help Guides • And more! Take control of your financial future today with Datamate™ Market Forecaster! 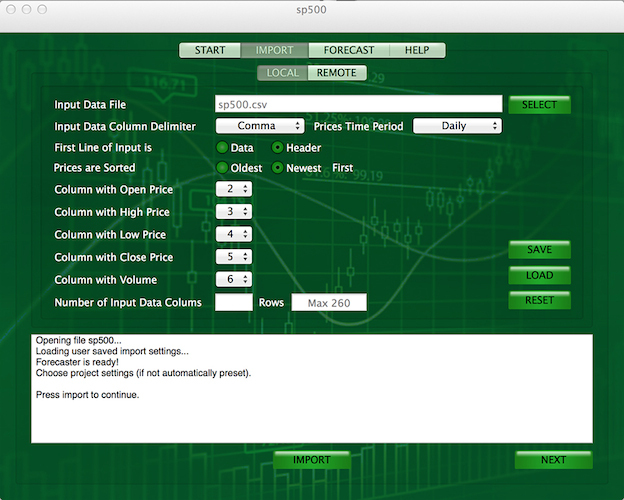 Simply create a new project, import the most recent historical price data, and click the forecast button. Indispensable financial tool for professionals, amateurs, retirees, and anyone else who wants to improve their return on investment, protect their financial assets, or increase their trading profits. *Minimum required data input is historical open, high, low, and close prices. 1. To start a new forecast click on the START REMOTE button, this will automatically bring you to the Import view, enter the ticker symbol and select the time period for your analysis, then press ENTER. 2. Click on the IMPORT button and read the Import Report to see if any errors occurred. 3. Click on the NEXT button, then the FORECAST button and wait for the the Forecast Report which will indicate the future price direction and for how many periods (days, weeks, months) forward the forecast is applicable for and the accuracy of the forecast for the security being analyzed. The higher the accuracy percentage, the greater the chance the forecast will be correct. 1. To start a new forecast click on the START LOCAL button, this will automatically bring you to the Import view, then select the data file containing the most recent historical prices to be imported (imported data is limited to 260 records). 2. Choose the type of column delimiter being used in the input data file (the character which separates the prices in each row), the time period, the type of data in the first row (column header or prices), and if the data has the most recent prices prices first or the oldest prices first (it's very important to get this right). 3. Assign the column number to the corresponding price location in the data file for all the price types (open, high, low, close; volume is optional), click SAVE to save the import data settings which will automatically load the next time you run this project. 4. Click on the IMPORT button and read the Import Report to see if any errors occurred. 5. 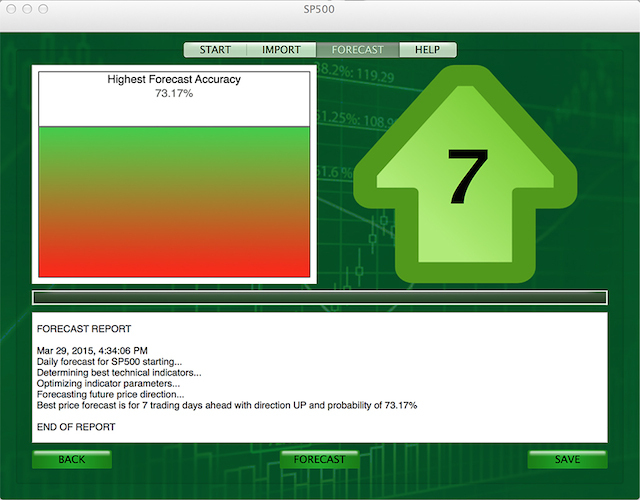 Click on the NEXT button, then the FORECAST button and wait for the the Forecast Report which will indicate the future price direction and for how many periods (days, weeks, months) forward the forecast is applicable for and the accuracy of the forecast for the security being analyzed. The higher the accuracy percentage, the greater the chance the forecast will be correct. What do the forecast results mean? They predict the direction of the price of the security being forecasted and the period of time in the future this change in price will occur. For example, if the results of a forecast is "Best price forecast is for 3 trading days ahead with direction UP and probability of 76.47%"... this means there is a greater than 76% chance the security price will be up 3 trading days from the last trading day of the historical price data used for the analysis. Note: There are many ways in which the forecast report can be effectively used, either as a stand alone price predictor or in conjunction with other market indicators and strategies. Also, we recommend you mock or paper trade to test any new investment strategies you choose to undertake and apply sound trading/investment and risk management policies. At times you will not be able to select certain tabs, this is the normal operation of the application. It is very important to know how the historical prices are sorted in the data file you intend to import and choose the correct setting during the import process; historical price data are sorted either by oldest or newest prices first. When making a forecast the report will indicate how many time periods forward the prediction is for, this is from the last date included in the imported historical price data file. Unless you are testing the forecasting accuracy with old price data, you need to use the latest (most recent) historical price data in order to make relevant predictions. You can store your historical price data file anywhere you like and navigate to it during the import process, but for connivence a folder named 'data' is automatically created within your project. You can store your forecast reports anywhere you like, but for connivence a folder named 'reports' is automatically created within your project. To print with the app, click on the View you want to print (to give it focus), then click on main menu item File and select Print. Data: The historical prices of the security, must include Open, High, Low, and Close prices; Volume is optional. Header: The first row of data in your historical data file with titles like Date, Symbol, Open, High, Low, Close, Volume, etc. Not all historical price data includes a header, this varies by vendor. Device Compatibility: All Macs running OS X 10.8 and above. Copyright © 2015 Procypher Corporation. All Rights Reserved.